Cannery Pier in Astoria was home to Chinese canners and Finnish fisherman in some past century of the life of Astoria, Oregon. These days, it’s the foundation for the Cannery Pier Hotel, a rather large, upscale establishment that doesn’t skimp on the little details. Upon approaching the hotel, which clings from the shores of the Columbia River, the balconies facing the water dripping over the current as it washes into the Pacific, an old fishing boat has retired itself from days of long shoremen and stuffing it’s belly full of Chinook Salmon to live a sleepy life of being on display underneath a pavilion for tourists to photograph. An old Cadillac, something from the 1950s, turquoise and oozing with class, is parked out front. For the Lady’s birthday, we rented ourselves a room that we could use as our primary residence for a weekend. I only mentioned in the “Notes” section of the online registration form that the day was particularly special, having been the mother of my children’s 30th birthday. I never spoke to a human during the entire process, until the moment we reached the front desk. After a few brief check in moments, the clerk handed her an envelope wrapped in a ribbon with “Happy Birthday” handwritten on the outside. Guests were enjoying a free wine tasting in the large lobby behind us, floor to ceiling windows framing the massive bridge that spans the Columbia River to reach out to the Washington side. “Will you be needing a ride tonight?” the clerk asks us. “In that Cadillac?” I inquire. Indeed, that’s specifically what she meant. “Yes, our driver is pretty booked up tonight, but we have 7 and 7:30pm availabilities.” We put ourselves down for 7:30 and made our way into the elevator which transited us up to our room. A clawfoot tub living in the bathroom, with shutters that allowed the typically private affairs of a bathroom to open up so that a bubble bath might not find itself mutually exclusive of a view through more large windows at the far end of our room and out over the same gorgeous view we’d seen from the lobby. From the balcony, seagulls and bright blue ducks took turns performing acrobatic feats, seemingly for our pleasure alone, as a cruise ship inched its way under the bridge. A pair of binoculars hung from the window seal, giving ever guest an opportunity to play amateur bird watcher or just spy on the going’s on happening on the river’s Washington shore. 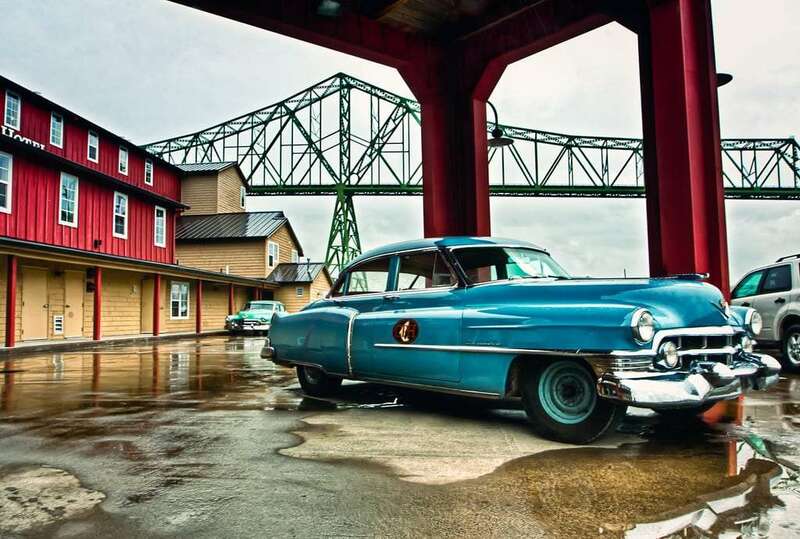 When 7:30 arrived and we found ourselves back in the lobby, a slender woman of about age 45, dressed head to toe in dapper chauffeur attire, hat and all as turquoise as the Cadillac itself, opened the door for us to slide into the back seat and slip into the past. She shuttled us around town, informing us that, if we didn’t choose to stay out too, too late, she would of course pick us up wherever we’d like (before 11pm) that night. We asked her to drop us off at Fort George Brewery, a hip little brewpub we’d call dinner and a drink to kickstart the evening, and she did so with a short tour along the way. We did end up requiring a cab that night, but even as we celebrated well into the beginnings of the morning, when the sun finally rose through our windows like a bugle call, the smell of salt coming through our open balcony door, and the knowledge that we had an entire new day to spend in the company of this hotel room, this beautiful little fishing town, well it’s hard to help but wake up with a smile.